Your manager may send you an email invitation. If so, you will receive an email that contains a link to create your account. The email will look something like the one below. After clicking the link in this email you will be directed to a page where you can create your account. This page will have a form that looks like the one below. After submitting this form you will be logged in and your account will be all set up! Can’t find your email invitation? You can resend yourself an email invitation if you can’t find yours. To do so, go the find your schedule page and enter your email. If we find your email in our system we will resend your invite. If not, you will get an error message stating that your email is not found. If this happens please contact your manager. It is likely that they entered the wrong email for you. 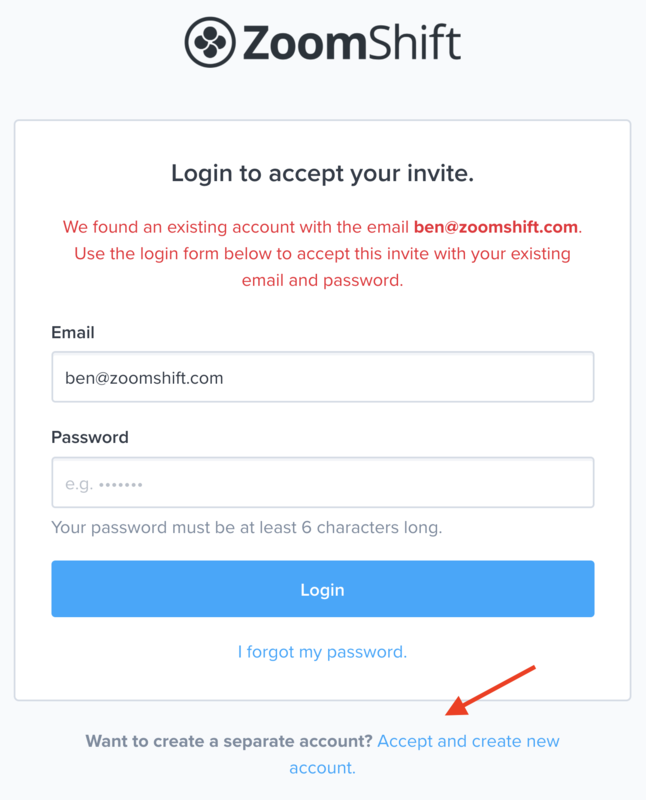 If you see a success message, but do not receive an invite email, contact us at support@zoomshift.com. Do you already have a ZoomShift account? If you already have a ZoomShift account, you will see a form like the one below. You can login to merge your accounts or click on the Accept and create new account link to create a new account. Your manager may decide to not send out email invitations and instead have you create your own account. If so, your manager will send you a link to your organization's registration page. When you follow this link you will see a page like the one below. Once on this page, find your name and click on it. Enter the required fields and submit the form to create your account and join the organization. If you don’t see your name then you should contact your manager. This probably means they haven't added you to the organization yet.